Optimal working dilutions should be determined experimentally by the investigator. Suggested starting dilutions are as follows: WB (1:500-1:2000), IHC-P (1:100-1:300), ELISA (1:5000). Not yet tested in other applications. Fig. Western Blot analysis of various cells using Phospho-C/EBP α (S21) Polyclonal Antibody. 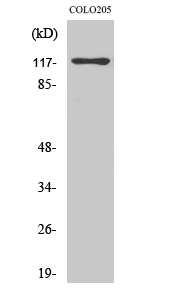 This intronless gene (CEBPA) encodes a transcription factor that contains a basic leucine zipper (bZIP) domain and recognizes the CCAAT motif in the promoters of target genes. 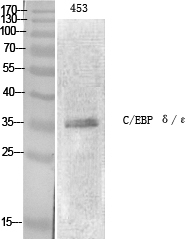 The encoded protein (CCAAT/enhancer binding protein alpha) functions in homodimers and also heterodimers with CCAAT/enhancer-binding proteins beta and gamma. 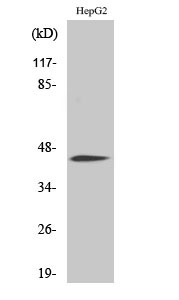 Activity of this protein can modulate the expression of genes involved in cell cycle regulation as well as in body weight homeostasis. Mutation of CEBPA is associated with acute myeloid leukemia. The use of alternative in-frame non-AUG (GUG) and AUG start codons results in protein isoforms with different lengths. Differential translation initiation is mediated by an out-of-frame, upstream open reading frame which is located between the GUG and the first AUG start codons. 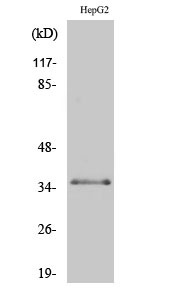 Phospho-C/EBP α (S21) Polyclonal Antibody detects endogenous levels of C/EBP α protein only when phosphorylated at S21.